I know Kim pretty well after first meeting her in a creative writing workshop years back. One gets used to baring their soul through storytelling in such endeavours. Just a few days ago, I watched her go through a visible, profound transition in a matter of seconds getting into and driving the 2017 Chevy Volt off the lot. She showed lightspeed reflection, assimilation, and changes in her expression and aura. Her shoulders dropped. Her face visibly relaxed. The 2017 Volt romanced her. She realized she could be free of contributing to air pollution the vast majority of the time without losing mobility and comfort. In fact, like other EV drivers, she found oh so much more. The transition is profound for many of us who never go back. 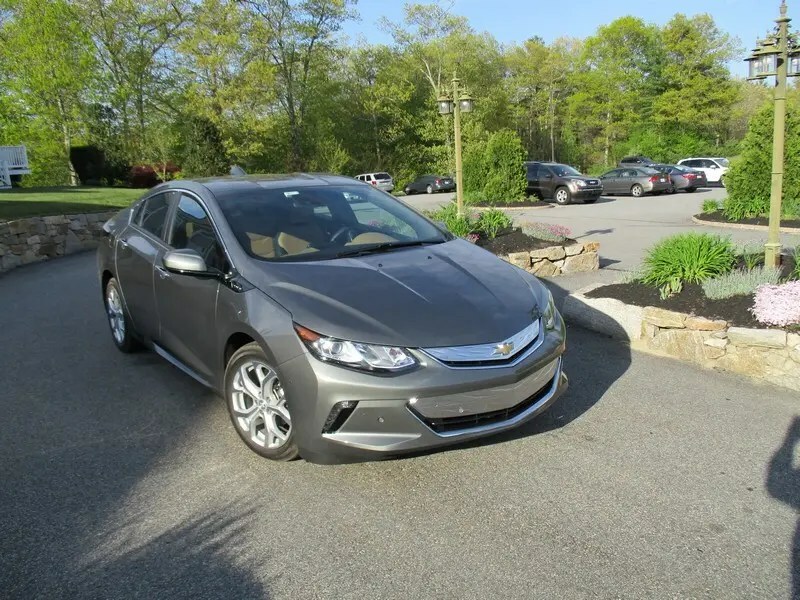 Kim found the 2017 Chevy Volt comfortably cradling her with a sophisticated feel. Our test drive companion and salesman was filling her in with all the goodness of the Volt. He described all the benefits to her that CleanTechnica and other EV blogs exclaim. She tried out the quiet horn on the left hand of the steering wheel to alert pedestrians and bicyclists to her whereabouts. Last month, I drove someone to the airport in a gas car, a rather nice gas car at that. The drive was so much less smooth, less adept, harsh, and intrusive to my senses (compared to the Nissan LEAF). I realize once again, we don’t know what we have till it’s gone. Already, I had forgotten the triggered headaches from unwelcome smells and noise. I accept that if I ever stop driving an EV, it will be the pedestrian and mass transit life for me. Kim became sure that she was trading her car in for some EV. Thinking of finances, she slid behind the wheel of a used Chevy Volt that was marked down $17, 000 — as it had 4,000 miles on it. She liked it quite a bit as well. Maybe more. Like me, Kim likes large and wide windows. She felt she enjoyed the visibility of the older Volt more than the 2017. In either case, now Kim thinks she is sure to be a Chevy Volt driver soon. I smiled in the midst of the test drive, realizing she was into the adventure. I told her that no test drive adventure is complete without the BMW i3. I explained that people either love it for distinct reasons or hate the look. I wanted her to find out which one she is. She was intrigued to find out as well. Kim spied the BMW i3 as we walked up. She loved it. Words we chose describing it included: futuristic, modern, cool, space age, sport, unique, spunky, space module. 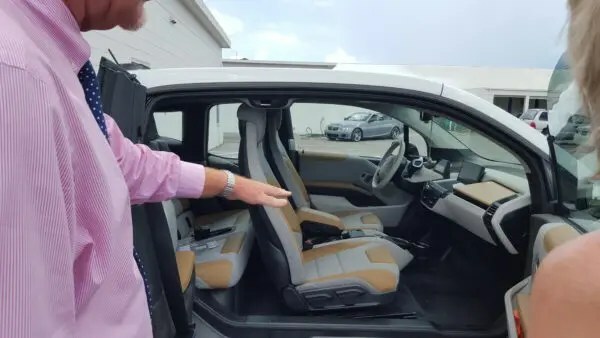 Below is the video of our test drive and Kim’s 3rd electric car experience. She is more than sold. She transformed. I smile. The whole world has gone mad (with dirty oil), and someone is securing her sanity. Kim asked about safety and the strength of the recycled materials compared to conventional automaker materials. 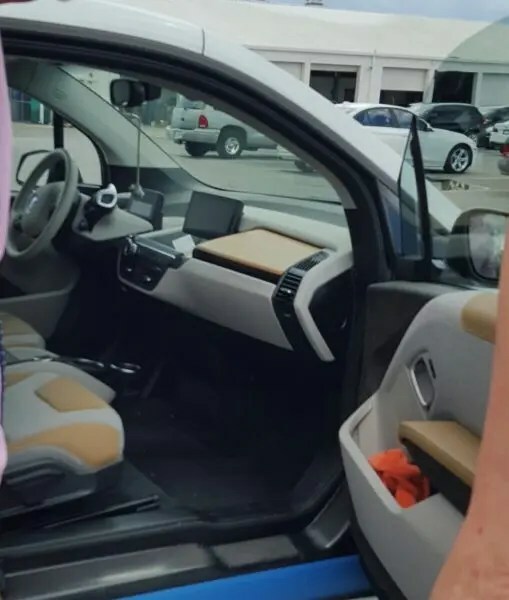 The salesperson (who is a BMW i3 owner) assured her that they are stronger by all comparisons. A spontaneous insight came about in the video as Kim pointed out you won’t be getting tickets in this EV for those rolling-red-light tickets that so many are receiving these days.